Catherine Goetze. The Distinction of Peace: A Social Analysis of Peacebuilding. Ann Arbor: University of Michigan Press, 2017. ISBN: 978-0-472-07341-2 (hardcover, $75.00); 978-0-472-05341-4 ($39.95); 978-0-472-90076-3 (open access, http://oapen.org/download?type=document&docid=625767). While not defining “peacebuilding,” other than seeing it as “activities conducted in countries and societies riddled by violent conflict,” Goetze argues peacebuilding exists “because it has become … an unquestioned way of political action … [and] a way of making a living” (1). This justifies her refusal to define the term: her project is precisely to explore the conflict “over the authority to define what peace is and how it should be built” (2). She sees peacebuilding as an “imprint” of a global power structure and seeks to examine this structure (7). Thus in a broad sense the book, while entitled a “social” analysis of peacebuilding, also examines peacebuilding politics. The book is structured around concepts drawn from sociologist Pierre Bourdieu’s thinking. As a Bourdieusian analysis of peacebuilding, it is to my knowledge the most comprehensive to date. “Fields are established,” Goetze says in Chapter 1, “by the weaving of webs of … relations between actors …, and by their competitive and distinguishing practices” (17). The resources that give actors access to a given field, and to positions within it, are conceptualized as capital. “[F]ields can be identified as such,” the author posits, “because they are internally structured by a specific configuration of forms of capital that determine the social hierarchy …” (20). The author’s interest in power in peacebuilding leads her to consider philosopher and social theorist Michel Foucault’s discourse analysis approach, but she finds this wanting. Referring to Bourdieu, she asserts that “powerful discourses, that is, such discourses that matter, are not only expressed in words and ideas, but are enacted. Some actors have more authority than others to speak; consequently, the power of discourses differs depending on who is speaking” (24, emphasis in original). The author further critically addresses the so-called ‘practice turn’ in International Relations. Practice, she argues, in line with Bourdieu, refers to “what actors do to affirm their position with respect to others” (25). Analyzing practices in and of themselves is of little value; to distill their meaning we need to read these practices into the web of relations that constitutes a field, and how they reflect and reconfigure the capital held by actors within it. Goetze is interested in why certain types of practice become dominant in a field, and hypothesizes this is because “they emerge as socially recognized forms of … behavior … through a complex struggle in which dissenting and alternative … practices have been socially … discarded” (27, emphasis added). So, what leads some practices to be discarded, while others get recognized? Goetze argues that in a given field, certain rules emerge which are internalized by actors within it. Habitus is this process of internalizing the field’s rules. Other scholars, such as Séverine Autesserre, have shown how activities coined as peacebuilding may be counterproductive, and yet may seem resistant to change. Habitus, Goetze suggests, helps explain why: “the reason why peacebuilders do not change their behavior is simply that practices, habits, and behavior do not change easily once they are normalized as habitus. It is the social function of the habitus to provide a stability of behavior that allows the entire field to act in a concerted and mutually understanding manner” (27-28). On this background, Goetze sets out to examine “how the social relations of peacebuilders are shaped”, and “how this shape influences their discourses and practices of peace” (35). To do so, she draws on several types of data. A survey was conducted with questions about social indicators, political values and worldviews, and “the everyday working lives” of the respondents (36), first in 2008 “with a selection of former staff” of the United Nations (UN) Interim Administration Mission in Kosovo (36), and a second time in 2012, then with “people who had worked or were working in other countries where UN peacebuilding missions were taking place” (37). The number of respondents in the first wave is not identified; 146 persons completed the second wave of the survey. Second, in-depth interviews were conducted (37). Neither their number nor the timing is identified; it is also not said what questions were asked, how informants were selected and how they can be characterized beyond being “peacebuilders”. Third, “about 550” resumes of people who had worked for “UN peacebuilding missions” (37) were used as “part of a larger N analysis of educational and professional trajectories in the field”. Fourthly, data was analyzed on “the first UN mission in the [Democratic Republic of the] Congo” (DRC) from 1960-1964 (37-38), mainly as provided in biographies and memoirs by people involved in that mission (38). Finally, data found in newspapers and “on the internet” was used “to retrace the career trajectories of higher echelons of the peacebuilding field” (37-38). The author does not reveal which newspapers or online sources were used, nor how many career pathways were examined (38). The diversity of types of data is a strength, but providing more details about them and how they were analyzed would have been useful. As for the pool of individuals, what was their composition in terms of, say, gender and national identities? In Chapter 6 the survey data is analyzed in terms of differences between male and female respondents, but neither their total number nor the relative male/female share is noted. Beyond Kosovo, in what parts of the world had the surveyed and interviewed individuals been working? And what methods were used for the large-N analysis of resumes, and to dissect trends in the other data? Elaborating on such questions would have bolstered the author’s later arguments. Moreover, would the individuals assessed have self-identified as “peacebuilders”? If not, how would the author justify labelling them in that way? In her analysis, Goetze first addresses how the field of peacebuilding emerged historically. If peacekeeping under UN auspices was traditionally concerned with policing a buffer zone between warring parties, Goetze argues that peacebuilding emerged in places where this “buffer zone concept … [was] impossible to realize” (64-65), arguing this was the case in Congo in the 1960s and the former Yugoslavia in the 1990s. “The [1960s] Congo mission was the first,” she claims, “in which effective peacekeeping was replaced by other activities such as maintaining law and order, providing humanitarian assistance, education and training, managing civil administration …” (65). Post-Cold War, she continues, the “lack of peacekeeping in places such as Srebrenica and Rwanda, led to a consolidation of these activities” (65-66, emphasis in original). Peacebuilding emerged as a “default” space, therefore, given that it “substitutes for the lack of the UN’s actual peacekeeping capacity” (66, emphasis in original). We know that many peacekeeping missions in the 1990s failed to live up to expectations, while the range of tasks attributed to them expanded. In this sense Goetze’s argument holds merit, but it falls flat in other respects. First, the importance of the Congo mission seems exaggerated. Was it really foundational for peacebuilding as an international set of practices? To substantiate such a claim, the author would have needed to bring in evidence about how this mission is regarded in the peacebuilding field today, and of what it actually did in Congo in the 1960s. The empirical analysis of this is thin and some statements are misleading, for example about the timing of the then army major-general Joseph Mobutu’s coup (49), and the duration of his presidency (44). It also repeats familiar stereotypes about this part of Africa, using phrases like “[t]he Congo was a mess, …[w]ithin hours, the country descended into chaos” (43). Moreover, the argument largely ignores the empirical literature which suggests that peacekeeping does work to keep peace, as discovered by Virginia Page Fortna and summarized by Fortna and Lise Morjé Howard. This scholarship gives rise to an alternative account of how peacebuilding emerged, namely, in response to a growing demand for peace-support interventions in the 1990s; combined with a growing supply, with the end of Cold-War deadlock. This combined with the rise of the liberal peace agenda, seeing political and economic liberalization as pivotal for war-torn countries. The state-building agenda was added in the 2000s — not the 1990s, as the author suggests (50) — in response to the attacks of 9/11 and growing concerns about security threats stemming from the Global South, combined with the realization that the competition spurred by liberalization requires strong state institutions to handle, as argued by Roland Paris and Francis Fukuyama. 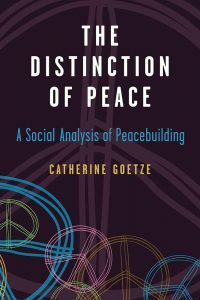 If her narrative about how peacebuilding emerged is debatable, Goetze’s main contribution lies in her analysis of how this field has been able to reproduce itself. She shows what kinds of people become part of the field, and how they manage to stay and gain positions in it. In this account, the average ‘peacebuilders’ have higher social-sciences education, typically with degrees from top European or North American universities. They are happy to accept short-term contracts and stressful environments because they believe, or profess a belief, in the importance of what they are doing. By moving from one “mission” to the next, flowing between conflict zones, they accumulate capital through connections and presumed insights, which allow them to assert, with growing confidence, a knowledge about how “peace” is built. Internalizing the rules of the field, they come to see the values of non-violence and “peace” as absolutes, and their field as having the tools to realize them. So it becomes natural for them to be critical toward people who question their field: having normalized its rules, they cannot see, or refuse to see, how criticism of peacebuilding as such can be justified. This helps explain the attitude of mild condescension that ‘peacebuilders’ sometimes assume towards critical questions of their work. If empirical research, for example, finds that activities pursued in the name of peace have unintended effects, or are counterproductive, the standard answer from the field will be that ‘we’ must ‘work harder’ to design the activities so as to reach their goals — while restating the overall importance of peacebuilding as such. The paradigm is not questioned. Like many good arguments, however, this one too can be taken too far. While it is true that much criticism of peacebuilding has been rebuffed from within the field, it is also the case that peacebuilding policy has changed considerably since the 1990s. Goetze’s reasoning might suggest that this is partly in response to criticism, but not the shaking of fundamentals such as the need for “experts” to intervene to provide leadership, liberal values, and social justice (as analyzed in Chapter 6). And yet, cannot the fatigue in Western capitals the shadow of Iraq, Afghanistan, and Libya indicate that the peacebuilding mantra is less resonant as of 2017 compared to, say, 2007? If peacebuilding is a paradigm in the philosopher of science Thomas Kuhn’s sense, and its basic tenets are under persistent pressure, at some point we can expect it to begin disintegrating and pave the way for new perspectives. If activities pursued in the name of ‘peace’ are persistently found not to reduce the overall level of violence, but to be associated with transformation and displacement of violence, will peacebuilding continue to thrive? As Goetze notes, the peacebuilding field depends on interactions with surrounding fields. For how long can peacebuilders maintain authority if insisting that renewed violence stems from technical factors, or factors beyond their control, and not dynamics embedded in the structure of intervention itself? Goetze further analyzes how peacebuilders think, assessing how they are likely to have been influenced by political theorists and leaders they identify as sources of inspiration. She lays out these thinkers’ arguments and how they have been presented, pointing to what elements she thinks peacebuilders are likely to have adopted to justify their work. But this method is not sufficient to pin down how the peacebuilders actually understood these thinkers, and may have been influenced by them. Not only are alternative readings of these thinkers possible; no evidence is brought to bear to show that the peacebuilders actually interpreted them in the way described. Goetze’s analysis of former president of South Africa Nelson Mandela, the leader the largest share of respondents said they were inspired by, is also underdeveloped. While she is right that leaders like him have been constructed as icons for mass circulation far beyond their original contexts, she does not mention that Mandela led a party which at one point adopted armed struggle as a means to fight apartheid. In South Africa, especially after the Sharpeville massacre in 1960, Mandela and other leaders of the African National Congress found that non-violence could only take them so far. They established an armed wing, whose ‘operations’ caused many human rights violations over the years. When released from Robben Island in 1990, Mandela met the crowds his hand held high, clenched as a fist. Goetze does not mention this aspect of Mandela’s story. And yet, if the peacebuilders were familiar with this part of his thinking, what might we assume about how Mandela would have influenced their approaches to peace and conflict, and to what extent these vary according to context? While the book is rich and has many sharp observations, at times arguments are taken too far and too much is read into the evidence. The data does not fully enable the author to illuminate how peacebuilders’ social relations are shaped. But the book’s strength lies in its analysis of the discourses and practices of peace. Goetze assesses these in light of peacebuilders’ class positions and career trajectories, as well political theory, thus substantiating a number of claims about how ideas of “peace” are used in this field to the effect of sustaining it. The Distinction of Peace is indeed a welcome addition to the growing body of critical peace and conflict research. Ingrid Samset is an Assistant Professor of Peace and Conflict Studies at Leiden University College The Hague, Leiden University. Her research addresses transitions from violent conflict, mainly in sub-Saharan Africa, with a focus on dynamics of security, justice and political reform. Séverine Autesserre, Peaceland: Conflict Resolution and the Everyday Politics of International Intervention (Cambridge and New York: Cambridge University Press, 2014). Virginia Page Fortna, Does Peacekeeping Work? Shaping Belligerents’ Choices after Civil War (Princeton: Princeton University Press, 2008); Virginia Page Fortna and Lise Morjé Howard, “Pitfalls and Prospects in the Peacekeeping Literature,” Annual Review of Political Science 11 (2008): 283-301. Roland Paris, At War’s End: Building Peace after Civil Conflict (Cambridge and New York: Cambridge University Press); Francis Fukuyama, State Building: Governance and World Order in the 21st Century (London: Profile Books, 2004). See for example Nelson Mandela, Long Walk to Freedom (London: Little, Brown and Company, 1994): 318-327; Nigel Worden, The Making of Modern South Africa, second edition (Oxford and Cambridge: Blackwell, 1994): 114-115.